Description: An SR-71A deploys its drag chute even before its nose gear touches the runway at the end of a 1990 research flight at NASA's Dryden Flight Research Center, Edwards, California. It was one of two initial Air Force SR-71 reconnaissance aircraft that were retired from operational service and loaned to NASA for high-speed research programs. Dryden had previously flown two YF-12A interceptor prototypes and an SR-71A (called a YF-12C) in an earlier supersonic research program between 1969 and 1979. 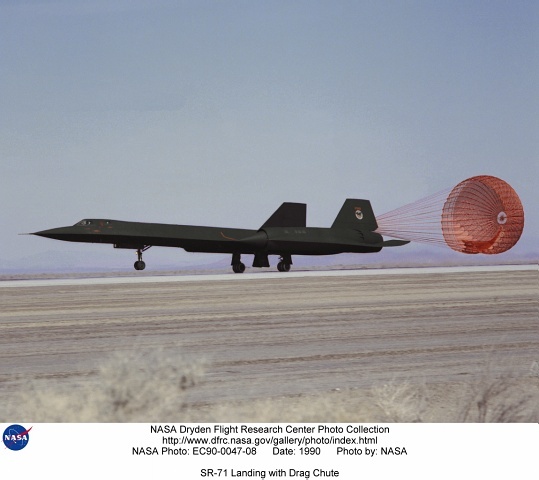 Keywords: SR-71; Dryden Flight Research Center; U.S. Air Force; sonic booms; Jet Propulsion Laboratory; LASRE; YF-12; Dave Lux; Steve Schmidt; Lockheed Skunk Works; Lockheed Martin; Pratt & Whitney; drag chute landing; YF-12; supersonic research.